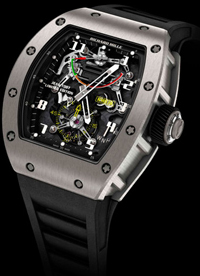 At the annual exhibition SIHH-2013 the Swiss company will present the new Richard Mille limited edition watches Tourbillon G-Sensor RM 036 Jean Todt (only 15 copies). New set up in support of the campaign on road safety organized by the International Automobile Federation FIA (FIA Action For Road Safety, headed by Jean Todt). Specifically for this model hour Renaud Papi Design Bureau has developed a system G-sensor, a measuring load experienced by the driver during braking. G-scale display is in a position of “12” hours. Green on her testimony marked safe for human red – critical. On a dark skeletonirovannom dial highlighted as white hour-markers and central direction. In position “6” hours posted tourbillon and small seconds. Titanium case measuring 50 x 42.7 x 16.15 mm is made in the traditional form of Richard Mille “barrel”.